The backdrop for the majority of Mountain Harvest Festival is the Town Park, a lush, green space shaded by enormous trees. In the distance Mount Lamborn watches over the valley and the North Fork of the Gunnison River flows just a few blocks away. The festival will happen rain or shine, so bring sunscreen and rain gear also. Feel free to bring lawn chairs, blankets, and reusable water containers. Please use street parking, while being aware not to block residents’ driveways. Feel free to bring lawn chairs, blankets, and a reusable water container. The festival will happen rain or shine, so bring sunscreen and rain gear also. Dogs are allowed. They must be on leash, with license. Please be considerate of others and pick up the poop. There are bags near the concrete picnic structure. It is not permitted to bring and consume alcohol or marijuana in Town Park or Downtown. 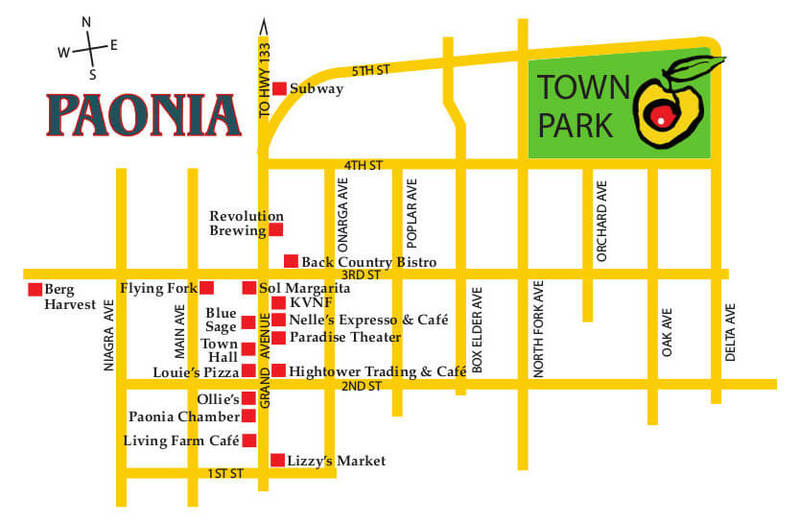 Downtown is just a few blocks from Town Park; and live music serves as your soundtrack. Don’t be surprised if you find yourself saying, “This is heaven on earth!” Thank you for joining us for a harvest of the senses! THE GREEN TEAM WILL BE BACK AT THE FESTIVAL THIS YEAR, MINIMIZING WASTE AND MAXIMIZING RECYCLING. Look for the attractive and very visible Recycling Stations throughout the park. Feel free to bring your own ware to go with the zero waste approach. And thank you for helping us reduce, reuse and recycle at the Mountain Harvest Festival! It’s a North Fork Valley tradition. Yes, Fido can come to the festival, as long as she or he is on a leash and always under your control. They must be on leash, with license. Please be considerate of others and pick up the poop. There are bags near the SE Pavilion. WHAT ABOUT LODGING FOR ME & MY DOG? Here is a list of local campsites; check to see if they are dog friendly. Several of our hotels are pet friendly, too; check out our Lodgings list and call around. Feel free to bring lawn chairs, blankets, and a reusable water container. The festival will happen rain or shine, so sunscreen and rain gear are a great idea. The park is in the middle of a neighborhood, so please park on the street, but be aware not to block residents’ driveways. WHAT ARE THE RULES ABOUT ALCOHOL, ETC? It is not permitted to bring alcohol or marijuana to Town Park or downtown.